Exit the highway at Heimsheim (Exit 46), turn right to Mönsheim, and turn right again in the center of Mönsheim to head towards Iptingen. In the center of Iptingen, take another right towards Nußdorf (Eberdingen-Nußdorf). Stay on the main street in Nußdorf until you reach the edge of town. Then take a left towards the industrial zone ("Gewerbegebiet"), Aurich and Vaihingen. You will see us off to the left. Take B10 towards Vaihingen/Enz; when you reach Enzweihingen, take a left towards Riet. Take a right towards Nußdorf when leaving Riet. 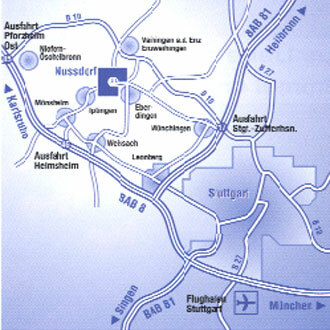 In Nußdorf, take the first right towards the industrial zone ("Gewerbegebiet"), Aurich and Vaihingen. You will see us off to the left.